Last month we introduced this series with the article titled, “Specifying Electronic Power Supplies from a System Point of View: Introduction”. In this article we explore importance of load characteristics when specifying a power supply. The figure 1 shows a power supply in simplified form, connected to a generalized load. The feedback and control circuit samples the output voltage, compares it to a reference (not shown), and adjusts the source voltage to maintain the load voltage constant. This process is not perfect, and the power supply specifications describe the deviation from perfection. The deviation from perfection must be within the requirements demanded by the load for the load to operate satisfactorily. 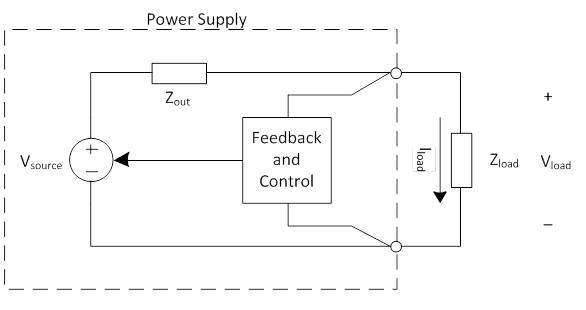 Figure 1: Simplified representation of power supply and load. Typically, the load requires one of the following parameters to be provided and controlled to within a certain tolerance band: voltage, current, or power. For example, a subassembly might be designed to operate with a controlled input voltage of 5 volts. When excited with a controlled input voltage of 5 volts, the subassembly responds by drawing up to 10 amperes, and consuming up to 50 watts of power. This example illustrates that the power supply must maintain the output voltage at 5 volts and be able to provide up to 10 amperes of current since up to 10 amperes is what the load draws when excited by 5 volts. In this case, power is an alternate way of expressing compliance since power is the same as voltage times current. Some loads may require different controlled parameters at different times. Such an example is a battery charger which might require constant current for battery charge mode and constant voltage for battery maintenance mode. Loads will require the controlled parameter to be within a certain tolerance band for proper operation. The power supply must maintain the controlled parameter within the tolerance band. These parameters may be expressed in terms of average, RMS, or a peak value with a duration qualifier. Loads also exhibit dynamic characteristics which change over time. Many types of loads frequently change their effective impedance. An example might be a computer printer which exhibits rapid step changes in effective impedance. For such a device to function properly, the power supply must be able to rapidly source spurts of output current while maintaining the output voltage within a specified band. This means that the power supply must have enough output capacitance and high enough control loop bandwidth to maintain the output voltage within the prescribed limits. Loads which have this type of behavior must have power supplies specified to limit the droop on the leading edge of the pulse, and recover to within a certain band of the steady state output in a prescribed time interval. Non-linear loads change impedance as voltage is increased. One example is a typical solid state circuit which might draw very little current at low voltages, and then begins to draw current with a very rapid and nonlinear increase as voltage is increased. A configuration which causes greater problems is cascading a power supply with a second power supply of a switching converter design. A switching converter has a nonlinear negative resistance characteristic. At very low input voltages, below the turn-on threshold, the current may be miniscule. When the input voltage is increased to the turn-on threshold, the input current suddenly draws very high current. As the input voltage is increased, the input current decreases, following a constant power characteristic. If care is not taken in the first power supply design and cable length, the load (the switching converter) will cycle on and off because of the voltage drop in the cable length and/or the output impedance of the power supply. Resonant behavior can occur due to inductance and capacitance in both the power supply and the load. Power supplies can resonate with load capacitance or inductance if the power supply is not designed well for the load. This resonance will usually take place at frequencies determined by the reactive elements in the system. This effect is usually undesirable unless the system is designed to be resonant. The power supply control loop behavior can be adversely influenced due to load capacitance and inductance. The presence of substantial capacitance or inductance can move the control loop poles and zeros, substantially changing the transient response and ripple rejection capability of the power supply by decreasing or possible increasing the bandwidth of the power supply. Loads must operate in their intended environment. More often than not, the power supplies for these loads must operate in the same environment. These environments may be benign, such as a test laboratory, or severe, as in down-hole oil and natural gas exploration. The power supply must be able to work in the environment of the load, or the power supply environment must be separated from the load to allow satisfactory operation. Watch for the upcoming articles on “Specifying Electronic Power Supplies from a System Point of View “.